BP says it will start shoving mud and maybe cement into the blown-out oil well in the Gulf of Mexico on Tuesday in what could be one of the final steps to plug it for good. BP PLC Senior Vice President Kent Wells said Monday that crews will likely start the so-called "static kill" attempt Tuesday if tests Monday determine the well can withstand the mud. There's no guarantee of success, and engineers still plan to follow it up days later with a similar procedure through relief wells they've been digging for months. But the oil giant's engineers and petroleum experts say it's the clearest path yet to choke the gusher and make it even easier for the crews drilling the relief well to ensure oil can never again erupt from the deep-sea well, which has spewed as much as 184 million gallons since the rig connected to it blew up in April and killed 11 workers. The developments have the makings for an interesting week. "It could be the beginning of the end," said Darryl Bourgoyne, director of Petroleum Engineering Research Lab at Louisiana State University. When it begins, crews will slowly pump heavy mud through lines installed last month straight down the throat of the leaky well. If the mud forces the oil back into the massive underground reservoir and scientists are confident the pressure remains stable, then engineers can pump in fresh cement to seal it. "The only thing that separates the oil from the sea now is the valve. This puts thousands of feet of mud and cement in between," said Eric Smith, associate director of the Tulane Energy Institute. "The idea is to have as many barriers as possible between the ocean and the reservoir. We're adding an extra level of safety." Officials may then begin the process of choking the underground reservoir feeding the well by pumping mud and then cement down an 18,000-foot relief well. BP officials have long said the process is the only sure way to choke the well for good - plugging up the source of the oil, not just its route to the sea. No oil has leaked from the busted well since engineers were able to fix a tightly fitting cap over its outlet two weeks ago, and boats skimming the oil and spraying subsea dispersant have been able to contain some of the spill. But critics have raised questions about the long-term effects of the dispersant on sea life, and congressional investigators said Saturday that the Coast Guard routinely approved BP requests to use thousands of gallons of chemicals a day despite a federal directive to cut its use. Toxic Chemical Used to Clean Gulf? Retired Coast Guard Adm. Thad Allen said Sunday that federal regulators did not ignore environmental guidelines, but that some field commanders were given the authority to allow more dispersants to be used on a case-by-case basis. CBS News correspondent Don Teague reports the lingering questions over the safety of the dispersants come as life on some Gulf beaches gets back to normal. 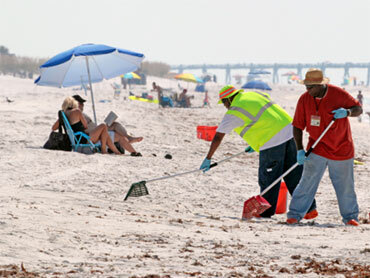 In Pensacola, Fla., there were crowded beaches this weekend for the first time in months - welcome news for business owners who say the worst of the oil spill depression may have passed. "I think we have more tourists. There are a lot of people from out of town," said one woman on the beach. The reality for most Gulf beaches is that oil from the BP blowout hasn't reached shore, and probably won't, reports Teague. BP's engineers, meanwhile, focus their time on their latest bid to stymie the oil for good. If the static kill attempt sounds familiar, that's because it is. The company tried a similar process, called a top kill, to choke the well with mud in May. It failed partly because the mud couldn't overcome the flow of the oil. There's reason to hope this time will be different. For one, the oil is no longer freely flowing from the well, thanks to the temporary cap that has contained the out-of-control gusher for two weeks. That means that engineers won't have to pump in mud with as much force, said Kent Wells, a BP senior vice president. There's always the risk that the pressure exerted by the mud will rupture the casing holding in the oil and potentially cause an even greater mess, but experts say it's very unlikely. "I can't imagine it failing. It's holding pressure and there's no indication of any loss of fluid from the well," Smith said. "It's a vanishingly small risk of failure." The whole procedure is still set to be completed by late August despite a brief evacuation for Tropical Storm Bonnie last week. And federal officials are downplaying its importance in case of a failure. Allen, the government's point man on the recovery effort, said Sunday that "static kill is not the end all, be all." BP has had more than its share of failures experimenting with other ambitious efforts. So if the oil is already contained and the completion of the relief well appears to be just around the corner, why is the oil giant even bothering to attempt the complicated static kill? One answer is that it should make it easier to finish the relief well, which BP and government officials have long said is the only permanent solution to the blown-out well. Crews are also drilling a second, backup relief well a few thousand feet behind the primary one, which is about 100 feet from its target. If the static kill is successful, though, Smith said they likely wouldn't have to use as much mud to choke the oil. It's also a good way for BP to hedge its bets in case the relief well takes longer than expected to work, he said. There's a third reason the company has embraced the static kill. Each day the temperature of Gulf of Mexico waters increases, so does the threat of another violent storm disrupting the cleanup process. Federal officials are hoping to end the oil threat once and for all before peak hurricane season, which typically lasts from mid-August to late October. "If we can get this thing shut in permanently before the August hurricane season, we will have dodged a huge bullet," said Rear Adm. Paul Zukunft, the government's on-scene coordinator.